“At last they entered a world - a valley of leagues where the high hills were fashioned of the mere rubble and refuse from off the knees of the mountains... Surely the Gods live here. Beaten down by the silence and the appalling sweep of dispersal of the cloud-shadows after rain. This place is no place for men." Spiti, also known as the “Middle Land”, is a trans- Himalayan terrain located in the north-eastern part of Himachal Pradesh in India. The name “Spiti” means “The Middle Land”, i.e. the land between Tibet and India. 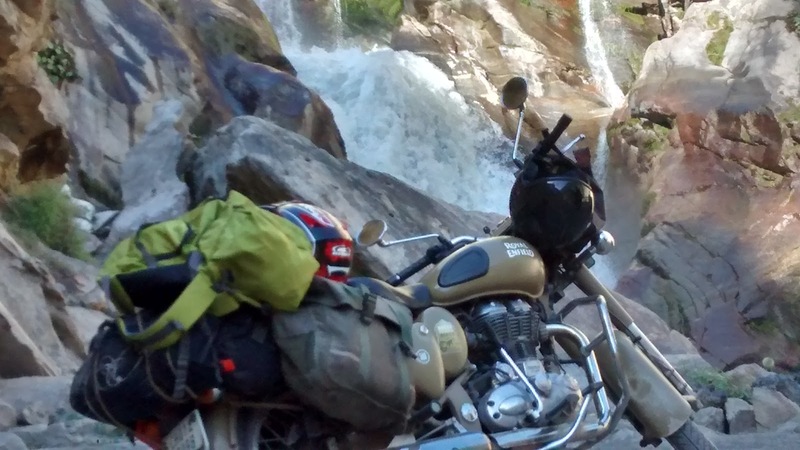 I always had that constant urge of packing off and exploring unknown virgin destinations on a bike. The urge kept on boiling since the time I bought my Thunder Bird 350 cc in 2011. Back there, due to family pressures and new job I could not fulfill my desires of exploring mountains on bike, meeting new people and understanding new culture. I got married to Bhavna, my soul in 2013. Ours was a love marriage and we did shared lot of common interests and hobbies. Fast Forward to late 2014, I first mooted the idea of having a bike trip to Ladakh to my four childhood friends. Me and one of my other friend were married while rest of both were enjoying their bachelor status. There was a straight no from my married friend since he and his spouse are settled in Pune and cannot take leaves from their Job required for a ladakh trip. The bachelor friends kept on telling that you plan things and when the 2015 season of ladakh comes let us know we shall bump in. Their words did not gave me much confidence. Nevertheless, I was firm on taking a bike trip and Bhavna also wanted to come. 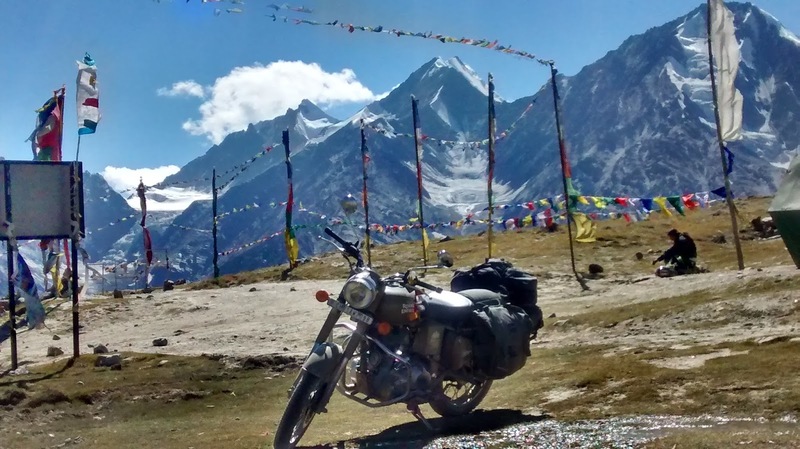 This gave me added motivation and I started planning for a bike trip to ladakh in 2015. I had given up hopes on my bachelor friends joining the trip so it was me and Bhavna alone. Few years back I had read about Spiti Valley and its enormous mystique. 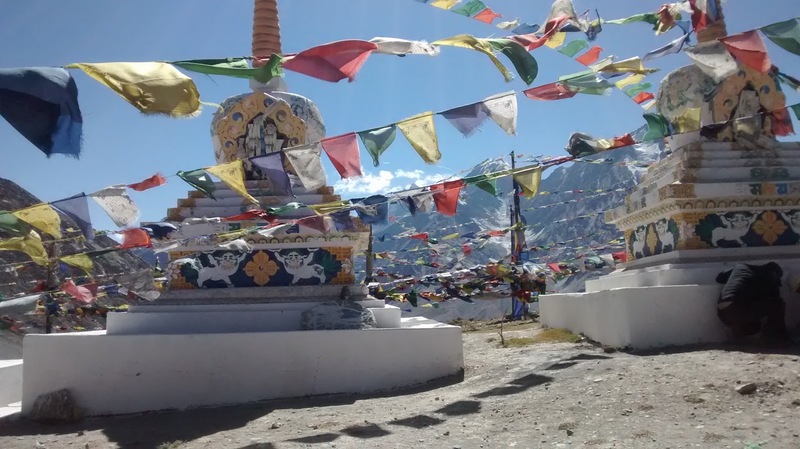 I started researching about Spiti and more I researched more I was drawn towards its beauty. Slowly my interest for Ladakh went down and I was completely swayed by Spiti. 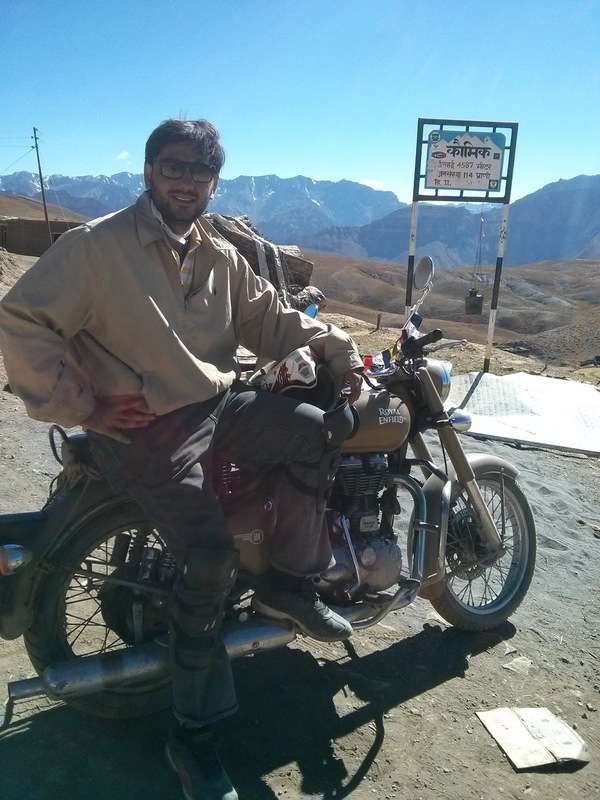 I also discussed with Bhavna about a bike trip to Spiti instead of Ladakh. Initially she was reluctant to go to such a unexplored place but looking to my childish face which had Spti written all over she agreed. 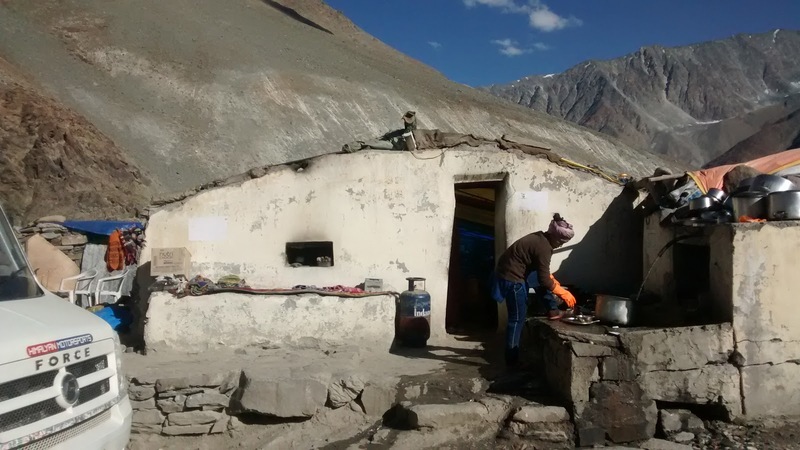 In April, 2015, me and Bhavna started preparing for a trip to Spiti Valley. 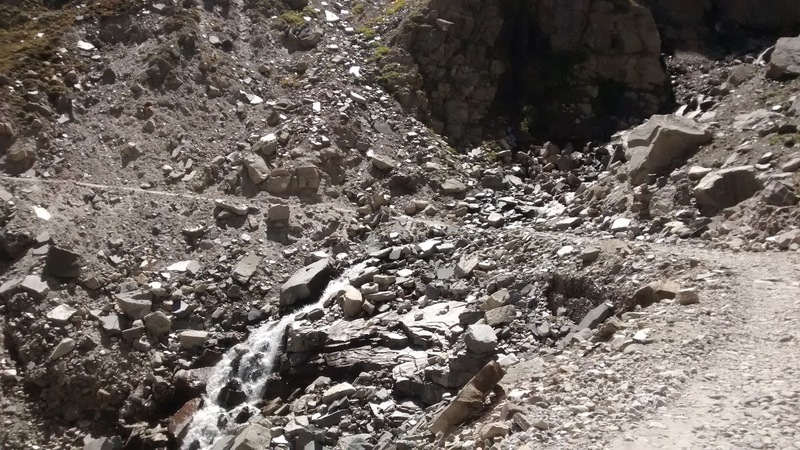 Please note that I have used the words ‘Ride towards’ against each destination since things never go as per the plans while riding in mountainous regions especially Kinnaur and Spiti Valley owing to landslides. I had booked a Desert Storm 500 CC from Royal India Bikes, Chandigarh for the trip and the owner, Rajiv was helped us a lot in planning us the trip. 3.A nylon rope – essential in case your vehicle breaks down in between and has to be towed down since getting a mechanic at such isolated locations are difficult. 4.Dry Fruits and chocolates – Necessary for surviving higher altitudes. However, the same were purchased by us near Shimla as carrying the same from Vadodara would mean carrying extra luggage. We packed only couple of jeans and few t-shirts for us since it is important to carry minimum luggage on trip. We had couple of ruck sacks with us. Royal India Bike gave us a Saddle bag at no extra cost. That was very helpful for carrying extra luggage during the trip. 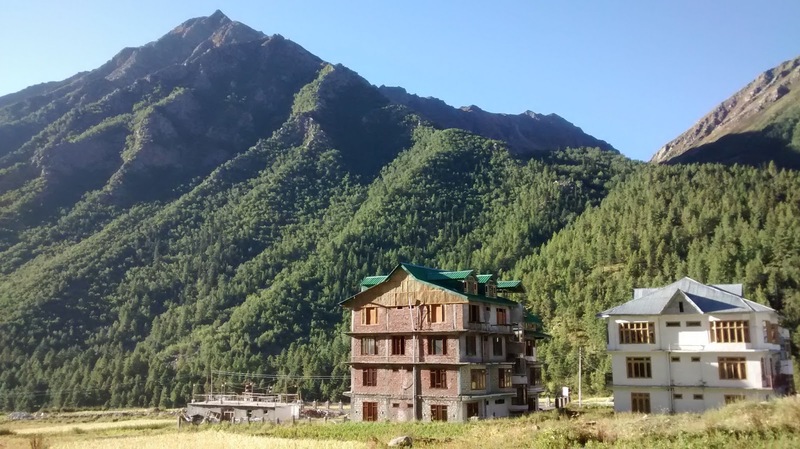 We had booked hotels at all places except Sarahan and Manali through Himalayan Shepherd. Went to the Office to finish urgent pending works. However, entire day could not concentrate on work being very excited about the trip to Spiti. We had all our luggage packed the previous day.. Ok Ok.. It was Bhavna who did all the packaging.. I left from the Office at 5.30 P.M. and reached home. Bhavna was already there at home applying finishing touches to the packing. We had booked the Mumbai-New Delhi Rajdhani Express from Vadodara for our journey to New Delhi. We reached Vadodara railway station at 9 P.M. and the train arrived on time. We boarded the train, had dinner on train and went to sleep. The train reached New Delhi railway station on time at 9 A.M. We had booked the 11.05 A.M. Paschim Express for our journey to Chandigarh. We had to pick up Camera from house of my Brother in law since we did not have proper camera to carry it for the trip. The house driver of my Brother in law delivered the camera to us outside the New Delhi Railway station. Once we had picked up the camera we went to a eatery in the premises of the station and had tea and aaloo ka paratha for breakfast. After a health breakfast we proceeded to the Platform to catch our train. The train arrived half an hour late and we made ourselves comfortable on our seats. During our journey to Chandigarh we discussed all the things that we shall do and places we shall visit during our road trip. We reached Chandigarh at 3.30 P.M. Called up Rajiv and confirmed from him the way to his place. He was not there in Chandigarh. However, he informed that one of his colleagues is there and she will help us. We reached the office of Royal India Bikes where we were greeted by one of the colleagues of Rajiv. She showed us our bike. We decided to start the ride today itself towards Shimla. It was decided that we shall ride till the time we are tired and stop for the day wherever we get a decent accommodation. We loaded the entire luggage on the bike and started our ride towards Shimla. Our excitement knew no boundaries. We reached outskirts of Chandigarh and then started the Himalayan Expressway. Here we had our first view of the mountains. I had been to Shimla and Dalhousie in past. 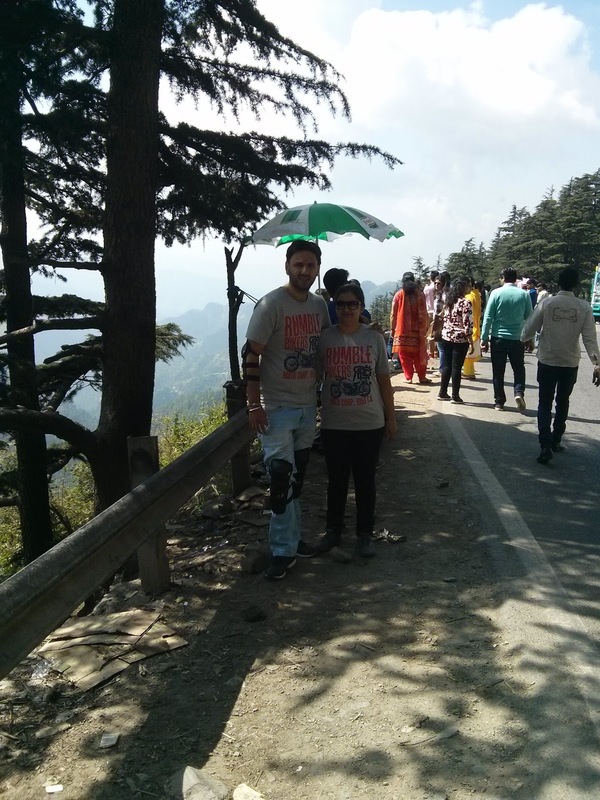 However, it was first time Himachal for Bhavna and she was pretty excited. No sooner we started gaining altitude and started the ride on the ghats towards Shimla. It was turning dark sooner and there was lot of truck traffic as well as traffic of cars rushing towards Shimla for the weekend. We decided to stop the ride for the day and find a suitable hotel for the overnight stay. We found a decent hotel in Dharampur and decided to spend the night over there. We checked into the hotel. The room rates was Rs. 1500/-. We paid the money in advance and checked into our rooms. We had a quick shower, changed our clothes and went to the restaurant for dinner. We had roti, sabji and rice for the dinner. It was getting quite cold and we decided to have a good night sleep so as to start early for our next destination Sarahan tomorrow. We woke up at 6.30 A.M. after a good sleep overnight. Had a quick bath and loaded the luggage on the bike. We decided to have breakfast enroute only and no sooner we hit the road by 7.30 A.M. for our destination for the day – Sarahan. Our first stop was at a tea stall near Solan and had hot tea and toasts. Once we were done with our morning tea, we started the journey and crossed Kandaghat in no time. We took the Dhalli bypass to avoid going inside Shimla City. We stopped at a small market near the bypass and purchased dry fruits and chocolates for the journey. We proceeded further and stopped at Kufri for breakfast. We had awesome Aloo Chat and Maggi enjoying spread of beautiful pine trees all over. We drove slowly enjoying the route and reached Narkanda around 2 P.M. We first purchased 2 Plastic cans of 5 litres each for carrying Petrol for the journey. We stopped at a restaurant in the main market and had dal chawal for lunch. After a rest of around 15 minutes we proceeded further for Rampur. On route to Rampur from Narakanda we had first view of the Might Sutlej.. It enters in India near Shipki La (Himachal Pradesh) and meets the Beas River in Punjab before finally moving to Pakistan terminating into the Arabian Sea. Ensure to fill up the tank and the cans at either Narkanda or Peo since next fuel Station is at Kaza. You would not like to be stranded at remote location for want of fuel. We reached Jeori at around 6 P.M. From Jeori, the straight road leads towards Kalpa while a right turn from the main market circle leads towards Sarahan. We took a right turn and started the steep climb towards Sarahan. Sarahan is a small town in Himachal Pradesh which has the famous Bhimkali temple (one of the 51 shakti peeths). We reached Sarahan by 6.30 P.M. and went straight to HPTDC Shrikhand for accommodation for the night. We did not have a prior booking and inquired about the availability of the room. We finalized a beautiful room for Rs. 2500/-. Sarahan has few other accommodation facilities also. However, one should stay at HPTDC Shrikhand only when in Sarahan. It provides a wonderful view of the Shrikhand mountain Peak. We checked into the room and had a bath. I went to the Bhimkali Temple first since it was closing time for the temple. Had a darshan and went back to the hotel. We ordered coffee and some snacks at the restaurant of the hotel. It provides beautiful view of the mountains and the hot snacks added to the beauty of the environment around. We had a stroll in the town for some time and ate our dinner at 9.30 P.M. and went to sleep at 11.00 A.M.
As per the plans, we were supposed to reach Rakchham which lies in the Baspa Valley by today. Woke up at 6 A.M and had a bath. Went to the Bhimkali Temple and had a quick darshan. Wifey was ready by the time I reached the hotel. We did the final packing and loaded the luggage on the bike. Had a hearty breakfast and started at around 7.30 A.M. for our next destination. The climb down from Sarahan till Jeori is steep. Encountered many apple trees in between. Requested a local resident who had a tree in his courtyard to give us few apples. He obliged us by giving few apples without charging any cost. From Jeori one has to take a right to proceed towards Rakccham. The road from Jeori till Wangtu are superb to ride. The troubles start after one reaches Wangtu due to the hydroelectric power plants over there. Construction activities and blasting have rendered the roads difficult to manage. The roads from Wangtu to Tapri were horrendous. While driving straight, I chanced to see how the construction workers were transporting construction materials through a trolley from one bank of baspa river to another. Due to this my concentration from the unpaved road ahead was lost and did not saw a big stone in the middle of the road. I lost my balance and we crashed into the mountain with the bike over us. Luckily, few workers were working over there. They immediately rushed and helped us. We had few bruises thought nothing serious. Wifey was bit terrified though. We rested for 15 minutes to get back to senses. Had tea at Tapri to refresh ourselves and started the onwards journey. Reached Karcham from where the Baspa Valley starts. From Karcham one has to take a right to go towards Rakccham. The straight roads leads towards Reckong Peo – the district capital of Kinnaur. 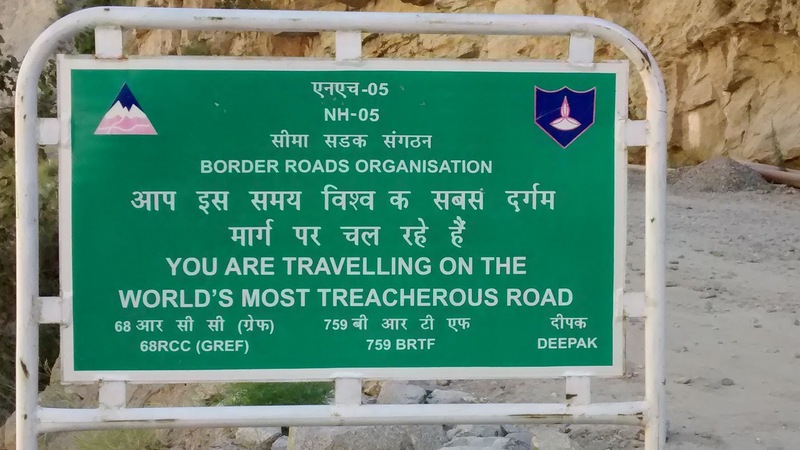 There is a straight road from Karchham Dam to Sangla however the road was closed and had to take a 24 kms detour to reach Sangla. There were no roads and it was all dusty trail. Wifey was getting irritated and we had numerous stops before we reached Sangla. Had coffee and few snacks there. Finally, we reached Rakchham at around 3 P.M. and checked into Hotel Apple Pie, which we had booked through Himalayan Shepherd. There was no electricity which is case with all the towns in the region. Water was pretty cold so cancelled the idea of having a bath. Had a rest for an hour to give rest to our battered backs and necks. Went to the restaurant of the hotel and had nice tea and pakoras. We then went to explore the Rakchham village. Only one word describes the village – Awesome. Beautifully planned and nicely maintained village. Spent about an hour there and went back to hotel as it was getting dark. Wifey was thinking of not going ahead with the trip due to the fall we had in the morning. However, could convince her that it was one of the things while undertaking such a trip and I shall be more careful in future. 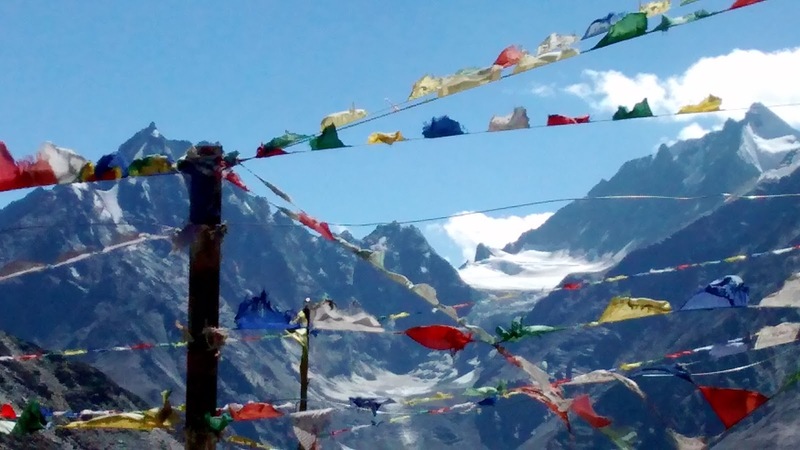 She agreed and we had our dinner at around 9 P.M. and went to sleep around 10 P.M.
Today our plan was to go to Chitkul, the last village on India – China border on Baspa Valley side in the morning before going to Kalpa our final destination for the day. Woke up at 6.30 A.M. Kept the luggage in the hotel as had to come back to Rakccham for onwards journey. Started for Chitkul at around 7.30 A.M. It was freezing cold out there and my hands were literally jammed while driving. It was a scenic drive towards Chitkul. Reached Chitkul at around 8.30 A.M. HEAVEN – is the word to describe the place. Nestled between beautiful mountains on the banks of river baspa, Chitkul is a place that will blow your minds away. Explored the town for half an hour and went down to the river bank. The water was freezing cold and felt surreal over there. Spent over half and hour there clicking few pics and went back to the village. Had a breakfast of Bread Omelet and coffee while wifey had bread toast with coffee. We bid goodbye to the beautiful village with a promise to come back again and proceeded back to Rakccham. Reached hotel at around 11 A.M. Packed the luggage and loaded on to the bike. Paid the bills and started our journey towards Kalpa. Again had to take that difficult detour and reached Karccham Dam at around 1 P.M. One has to take a right for Kalpa from here and we company of might Sutlej all the way. Reached Powari at around 1.30 P.M. There is a fuel station at Powari. Asked the attendant for fuel and he replied in negative. Please note that the fuel station at Powari is closed at almost all the times and is not reliable. The straight road from Powari leads towards Pooh while a turn left side goes to Reckong Peo and Kalpa. We took the turn and started the climb towards Reckong Peo. Reached Peo at around 2 P.M. and first went to the fuel station to refill the tank and filled the tank completely. I thought of skipping Kalpa and going ahead with the trip and try to reach Nako by the evening. Shared the plans with Wifey. Initially she was reluctant but eventually agreed. There were 4 guys from Delhi whom we met at the fuel station. We had seen them in the morning at Chitkul. They were also taking the same route as us. They also had plans to skip Kalpa and reach Nako by the evening. So it was decided to target Nako by the evening. We went around looking for food for lunch. However, all restaurants were closed and one of local grocery shop owner told us that there was a Langar arrange today at one of the government place of the town and all the citizens are at the Langar including the restaurant owners so all the restaurants are closed. We were happy to see the bonding amongst the citizens and took few chips and biscuits from the grocery store and proceeded towards Powari. From Powari we started for Nako. 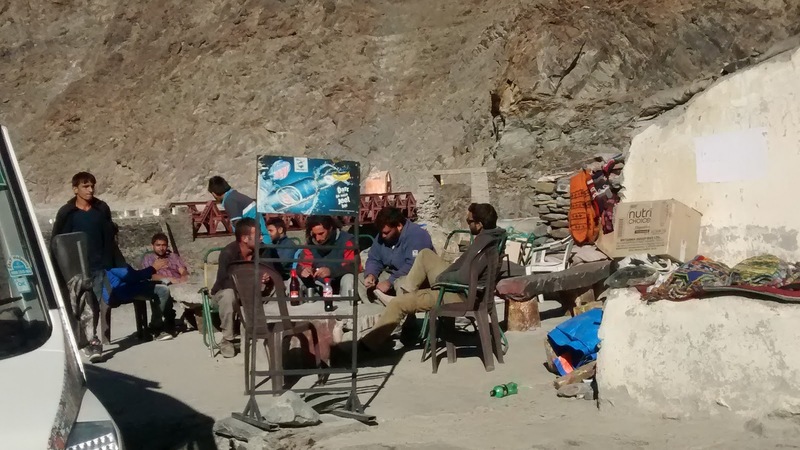 We had company of those 4 guys through our trip till Kaza. Our first stop was at Kasang Nallah. It is a beautiful set up with water flowing with might. Those 4 guys also reached there in no time. We spent few time over there enjoying the beauty and clicking the pics. Due to previous day accident, there was some damage to the bike. The fabrication of the horn had come out as also the silencer was loose. Saw a mechanic shop at Skibba, The Delhi guys were already there. One of the bikes had a puncture. They were attending to the same. We also went to the mechanic shop and fixed our problems. Kindly note that the mechanic at Skibba is very reliable and you should stop there to check your bike even if there is no apparent problem with it. Had tea at a shop beside the mechanic shop. My back was giving up due to the bad roads (you can say no roads). However, I went ahead driving slowly with all might and we decided to stop at any village having accommodation in case I am not able to ride further. Nako was ruled out and we targeted Pooh. Reached Spello at around 6 P.M. and by that time my back and neck had completely given up. There was a hotel in the main market. However, it did not gave me much confidence and I decided to ride ahead. With lot of troubles we managed to reach Pooh town. The last 30 kms from Spello to Pooh were like a hell. Now, the problem was finding accommodation since it was very dark. We again met the Delhi guys and they were planning to stay at the PWD Guest House of Pooh. However, they were also not sure of getting the accommodation at PWD Guest House since it requires prior booking. However, we decided to give it a try and started for it. The guest house is located at a distance of 3 Kms from the town and one has to take a climb up to reach. We reached there and the caretaker told that he is expecting some government guest and can give only two rooms The delhi guys decided to take one room and were gracious enough to give us another one. We checked in to the room. There was no electricity and hence decided to not to have bath. My back was aching like anything and first thing I did was applied Relispray over back and neck to soothe it. We had a rest for some time before going for the dinner. I had the best dinner of my life at such a remote location of the country. The cook had prepared the best rajma, sabji, rotis, kadi and rice. We ate to the satisfaction and strolled around the campus of the guest house. It was such a beautiful experience and we could see the milky way formation due to no pollution. We retired for the day at around 10 P.M. and had one of the most difficult rides of the trip. Today it was going to be relatively shorter ride as our next stop was going to be Tabo which is around 90 Kms from Pooh. Although, 90 Kms driving in such a terrain will be equal to 200 kms of driving on normal roads. We woke up at around 6.30 A.M. and asked caretaker for breakfast and tea. He replied in negative saying that he has ran out of stock. So we decided to have tea and breakfast in the town. Paid Rs. 600 as rent to the caretaker and loaded the luggage on the bike. The delhi guys were planning to start late so bid goodbye to them and started our journey at 8.30 A.M. from the guest house. The town was all sleepy and we could not locate any restaurants to fill in our hungry stomachs. Had tea at one of the roadside shop and proceeded further. The roads from Pooh to Khab were again very bad. We reached Khab at around 9.30 A.M. Took us around an hour to complete the 15 kms of distance between Pooh and Khab. Khab is a small village in the Kinnaur valley where there is a confluence of Satluj river has its origin in Lake Mansarovar, Tibet and Spiti river which flows from Spiti valley. It is a beautiful setting with two different colours rivers meeting and merging into one river. We stopped there for some time and proceeded ahead. The road ahead was relatively good and our next stop was Nako. Nako is a small village located on the India-China border. It is famous for its lake, the Nako Lake. It is also famous for its apples and dried apricots. One has to take a 10 kms detour from the main road to reach Nako. It is a beautiful ascend towards Nako. We stopped outside the village at a restaurant to fill our hungry stomachs. The restaurant provided beautiful view of the valley and we had aalo ka paratha and coffee enjoying the view. We reached the town once we were done with our food. We parked our bike in the market and asked for the directions towards the lake. The locals guided us towards the lake. We kept the luggage on the bike. Be rest assured if you have to keep your luggage on your vehicle as there will never be any theft. The people of the region are very innocent. We were let down by the beauty of the lake as had heard a lot about the place . However, it was only half of what was described all over. We spent few minutes there and went back to the village. Wifey shopped for some local things and we started our journey towards Tabo. Our next stop was at Sumdo where there is an army checkpost. One has to enter the traveler and vehicle details there before proceeding further. It is also from here where the Kinnaur Valley ends and Spiti Valley begins. 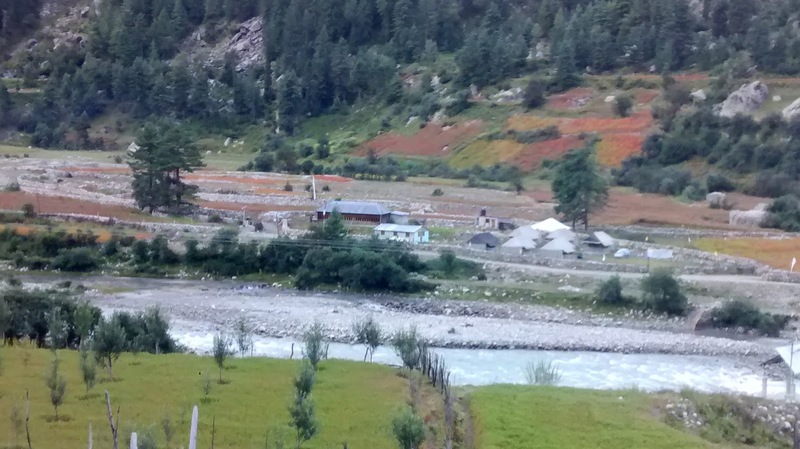 A detour leads to Kaurik, the last village on India China Border. However, considering he sensitivity of the place, travelers are no allowed there without prior permission. We decided to skip going to Kaurik and proceeded further. 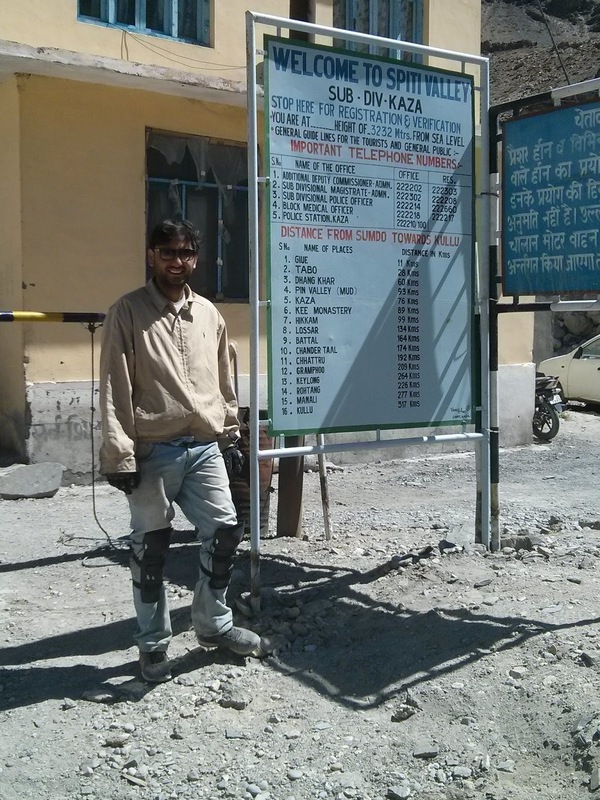 We reached Tabo at around 4 P.M. and checked into Hotel Trojan House booked through Himalayan Shepherd. We asked for lunch there and the manager obliged us with lunch consisting of rotis, dal and rice. Once we were done with our lunch we rested for some time in the room and headed straight towards the monastery as it closes by 6 P.M. The monastery was founded in 996 AD by Ringchen Zangpo, the king of western Himalayan Kingdom of Guge. The monastery had peaceful surroundings and few minutes spent over there soothed out battered bodies. We spent some time around the monstery and went to the local market. Had coffee at one of the restaurants and strolled around before going back to the hotel. While going through the market located a hotel where lots of foreign travelers were there. Decided to have dinner there anticipating it to provide variety of dishes. Rested for some time in the hotel and went to that hotel we had seen in the evening. It turned out that a local had converted his house into a home stay. We ordered local cuisine and coffee. The atmosphere around was very good and had a healthy course of meal. Went back to the hotel and immediately felt asleep. Woke up at 6.30 A.M. and did the routine of loading the luggage on the bike. Went to the hotel where we had dinner the previous day for breakfast. Had a healthy breakfast there and started at around 8 A.M. for our first stop of the day, Dhankar Monastery. 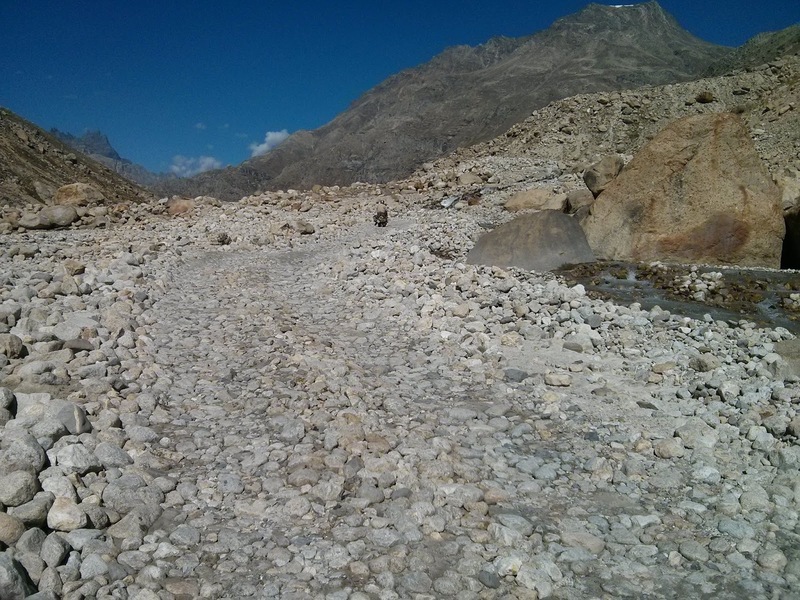 For reaching Dhankar, one has to take a straight road from Tabo and reach Sichling village. 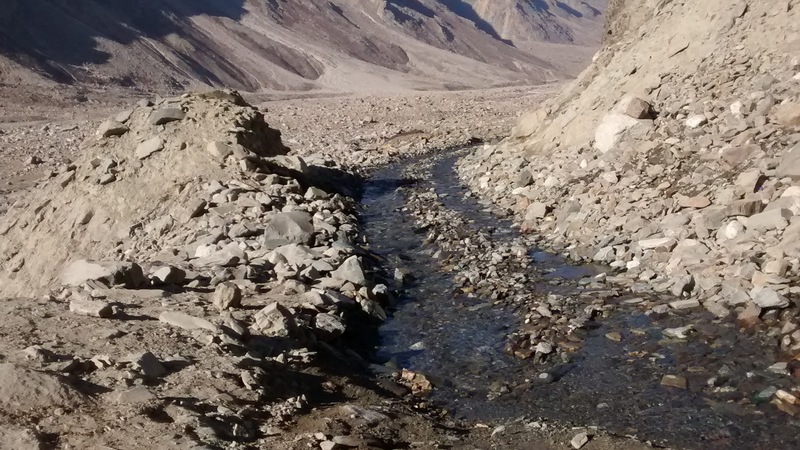 From Sichling, there is a detour towards Dhankar while the straight road leads to Kaza. We took the detour at Sichling and started the ascend towards Dhankar. Reached Dhankar at around 10 A.M. and parked the bike in front of the new monastery. Went to the monastery and clicked a few snaps. The old monastery is located further above the hills. We went there and spent some time over there enjoying the mystical settings. We then went to the restaurant located in the premises of new monastery and had our breakfast. Post the breakfast, we started our descend towards Sichling. Reached Kaza at around 3 p.M. and went straight to the main market. There is a SBI ATM in the market and I asked Wifey to withdraw some cash for onwards journey as the next available ATM will be at Manali. Till time wifey withdraws the money, I decided to tank up at the IOC Fuel station which is on the outskirts of the main market. It has the distinction of being the world’s highest retail outlet of fuel. I filled up the tank since next fuel station will be at Manali. I decided to go to the local mechanic to have my bike checked. The mechanic told that the chassiss has suffered damage and requires fabrication. I have to go to a local fabricator to fix it. I picked up Bhavna from the market, had some tea at a local shop and went to the fabricator to fix it. Things were done by 4.30 P.M. and we headed to Hotel Deyzor where we had our bookings for 2 days. The hotel is run by Mr. Karanbirsingh Bedi along with a local guy who jointly own the Himalayan Shepherd travel firm. I was not feeling well and was having slight fever. Bhavna wanted to go to the market to purchase some local things. I asked her to go alone since I was not in great shape. I had a good sleep for two hours before being woked up by a call from Bhavna. It was getting dark outside. I was very hungry and we both went to the restaurant to have a quick bite and coffee. We headed back to the room again and we both went to sleep. We woke up at around 8.30 P.M. and went to the restaurant for dinner since we did not wanted to go to market again. We ordered some Punjabi food and ate it to our satisfaction. We went to sleep at around 10.30 P.M.
Today the day was reserved for places around Kaza and we were relieved by the fact that we have not to carry all the luggage with us. We started from the hotel at around 7.30 A.M. and went to the local market. We had coffee and breakfast at one of the restaurants and started for first destination of the day – Key Monastery. One has to take the route towards Rangrik and there will be a bridge. Do not take the take a left for the bridge which goes to Rangrik. Instead, go straight and from there the ascend for Kye Monastery shall start. We reached Kye at around 10 A.M. where we met those Delhi Guys. They had stayed overnight in the monastery which provides accommodation for the tourists. We spent almost an hour at the monastery and it was one of the most beautiful placed I ever had been to. Spent some time with the lamas over there and understood from them the customs and traditions followed there. We then proceeded for Kibber village, which not long ago has the distinction of being the highest inhabitated village in Asia. However, Komic Village has now taken that distinction. Spent some time at Kibber and clicked few snaps before descending again towards Kaza. One has to cross that bridge intersection and go further towards Kaza and on left side of road a upward ascend will be there. The road leads to villages of Langza, Komic, Hikkim and Hokim. The road till Langza was all in a mess or you can say there were no roads at all. Our backs bore a lot of brunt of bad roads. We reached Langza at around 1.00 P.M. The beauty of the place soothed all the pain. For me, Langza was the most beautiful place we visited during our trip and even more beautiful than Chitkul. We spent some time there and sat at a local pea farm. The local woman over there gave us fresh peas to eat which were were good. We asked for the rare collects of the Tethys Sea and she gave us couple of rare stones at Rs. 100 each (for more information on Tethys Sea visithttps://en.wikipedia.org/wiki/Tethys_Ocean). Met local children over there and distributed chocolates to them. They were very happy to meet us and we clicked few pics with them. We then proceeded towards Hikkim which has the twin distinction of being the highest polling station in the world and the highest Post Office in the world. We spend some time over there as the post office was closed and headed towards Komic. Komic has the distinction of being the highest inhabitated village in Asia. We reached Komic at around 4 P.M. It was quite cold out there and the air was also very thin owing to the altitude. We stayed there for only few time as it was getting difficult to breathe and started back for Kaza. We reached Kaza at around 5.30 P.M. and headed to the main market to eat something. We then went back to the hotel to rest for some time. Today we decided to explore some local restaurant for dinner. We zeroed down to the restaurant ran by Spiti Ecosphere, a social enterprise working for sustainable development of Spiti. We had some local cuisine there and purchased some souvenirs. Had yummy seabuckthorne tea there, went back to the hotel and crashed to sleep. Woke up at 6.30 A.M. and got freshen up. Our target for the day was majestic Chandrataal lake. The luggage was loaded by 7.30 A.M. Met Karabir in the restaurant and settled the bills. Thanked him for the hospitality and parted with a promise to come back soon. Went to Spiti Ecosphere for food and had a healthy breakfast there. Started at around 9.30 A.M. for Chandrataal and passed through various villages like Rangrik, Hanle etc. Our fist stop for the day was Losar at around 1 P.M. where there is an army checkpost. Entered our details as well as that of our bike and proceeded further. We met 4 guys from Israel there and exchanged pleasantries. Around 20 Kms. from Losar lies Kunzum La. We reached there by 2 P.M. It is situated at around 4550 m above sea level. It offers view of Bara-Sigri, the second longest glacier in the world. It has also a temple dedicated to Kunzum Devi. We went to the temple and asked for blessings from Devi for our future journey. The entire place is mystical with strong winds and cold. We stayed there for half an hour and proceeded further. Going further, we had a fall while negotiating a dangerous curve. My hand suffered few bruises and the difficult roads added to the problem. No sooner the detour for Chandrataal came. It is a 12 kms drive from here and further 2 kms. of walk leads to the lake where there are tents for overnight stay. The bike also had suffered some damage and we were also not in great shape to take the road which was very bad. With a heavy heart, we decided to skip Chandrataal and headed towards Batal. Reached the famous Chacha Chachi dhaba in Batal at around 3. It is a must stopover for travelers going from Kaza to Manali or other way round. Till last year there was no accommodation facility at Batal and one had to stay at the tent accommodation provided by the Dhaba owners. But now a PWD guest house has come up opposite to Dhaba. Met the Israeli guys over there and had talks with them. It turn out that they serve the Israel National army and had come to Spiti for some adventure. With help of Chacha booked a room at Guest House. First thing we did was have lunch at the Dhaba. We had wonderful dal chawal and coffee there and went to the PWD Guest House for rest. Kept the luggage on the bike only and took the essentials for the night. We rested for an hour. Went back to the Dhaba for food and ate to our satisfaction. We went back to the Guest House at around 8.30 P.M. and were asleep by 9 P.M.
Woke up to a freezing cold. Went outside to feel the surroundings and it was totally heaven out there. Woke up Bhavna and we both got ready for the day. Paid to the caretaker of the guest house Rs. 600 rent and went to the Dhaba for breakfast. We had a heavy breakfast due to cold and settled the bills with Chacha. We bid goodbye to both Chacha and Chachi and thanked them for the hospitality extended. Our destination for the day was Manali. It was going to be the most difficult ride of the trip as we have to pass numerous nallahs in between especially near Chotta Dhara. We started at around 8 A.M. from the Dhaba. The roads were very bad fill with pebbles all around. We had company of Chenab river almost till Gramphoo. The roads till Chotta Dhara were like hell and had deep nallahs on the way. 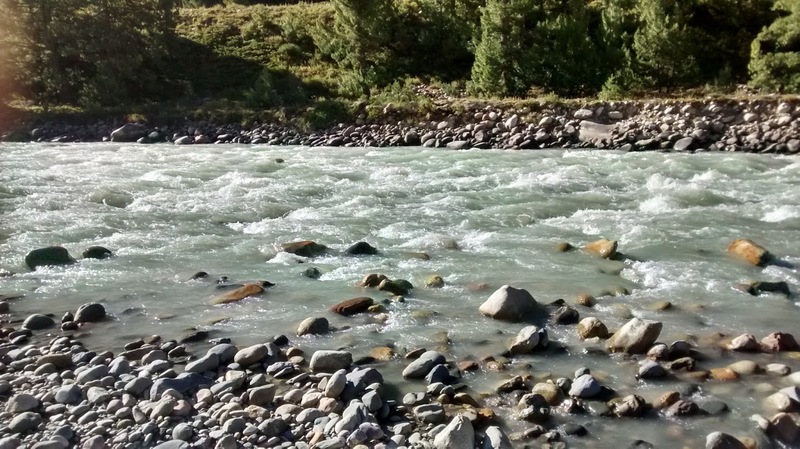 Every time a Nallah comes, Bhavna crossed it on feet while I waded through waters slowly. I was hit by stones and pebbles on my feet while negotiating the nallahs. It was a experience in itself though. We reached Chhatru at around 12 P.M. where we had our first stop for tea and snacks. We ate at a local Dhaba there and rested to give our sore backs time to heal. Few more nallahs came till we reached Gramphoo. In all we had to negotiate 9 nallahs in between. 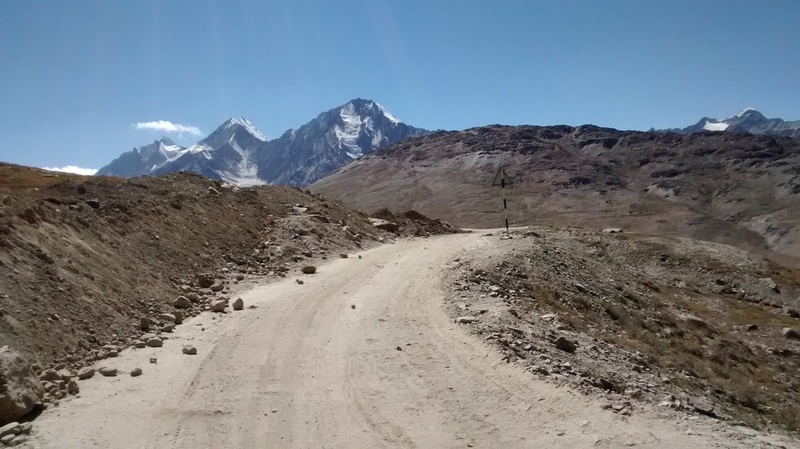 From Gramphoo, one road leads towards Lahaul Valley and further upto Leh while another road leads towards Rohtang La. We slowly started our ascend for Rohtang La and reached the same by around 3 P.M. We spent some time over there and proceeded towards Manali as it was a mad tourist rush there. It felt completely different since last few days we were accustomed to minimal human sightings. We started our descend towards Manali and crossed Marhi in no time. We reached Mall road at around 5 P.M. and checked into Hotel Kunzum, an HPTDC hotel. I immediately took a bath as since last few days we did not had hot water for bath. We then went to the Mall Road for snacks and some local purchases. Went back to the hotel and rested for some time. Went again to Mall Road for dinner and ate at one of the local restaurants. We got back to hotel at around 11 P.M. and went immediately to sleep. It was going to be last day of our wonderful trip. Woked up with lot of memories of the trip and with a promise to come back again soon. Settled the hotel bills and loaded the luggage on the bike. We were to reach Chandigarh today and hand over the bike to Royal India Bikes. It was going to be longest journey in terms of distance in a day for us. Started at around 8 A.M. from Manali and took Manali-Kullu-Sundernagar-Bilaspur-Kiratpur Sahib-Roopnagar-Chandigarh route. Stopped at Kullu for breakfast and tea. The roads from Sundernagar till Kiratpur Sahib are prone to heavy traffic especially at Bilaspur. Reached Chandigarh at around 7 P.M. taking regular stops in between. Handed over the bike keys to representative of Royal India Bikes and paid the bills. The air was filled with nostalgia and with lots of memories we headed towards the Railway station where we had to catch our train for New Delhi. We boarded our train and immediately went to sleep. The train reached New Delhi Railway Station around 7 A.M. We decided to take a Hotel near Airport as we had flight to Baroda next day. Took a taxi and finalized a hotel near Airport. We checked into our rooms and rested for some time. We decided to explore some parts of Delhi and at around 2 P.M. started from our Hotel. We went to Delhi Haat, Sarojini Nagar Market and Chandni Chowk. We went to famous Parathewali gali in Chandni chowk and had yummy parathas there. Went back to the hotel at around 11 P.M. and went to sleep. We had our flight back to Vadodara at 11.10 A.M. We checked out of the hotel at around 9 A.M. and reached airport by 9.30 A.M. The flight was on time and we reached Vadodar at 12.30 P.M. ending our mystical trip. 1.Total travel by bike – Around 1400 Kms. 3.Visited the highest polling station and highest post office of the world. 4.Visited the highest inhabitated village of Asia. 5.Crossing numerous water crossings on the way. To sum up it was the most exciting trip of my life. Doing it with my better half added to the excitement and fun. It taught me lot of things and I look forward to visit this mystical place soon. Great log dear. Kudous to you for completing it at a go. can you share the details of charges you paid for bike.